Elsa Arana, Granada Hills resident, made the decision to donate her son Marco’s organs when he passed away suddenly at the age of 28 in a car accident. In 2010, the Arana family had the rare opportunity to meet one of Marco’s organ recipients: David Jones, a young African American man who had been undergoing dialysis treatments for 11 hours a day before he received the life-saving gift of a kidney. Now, Elsa dedicates her time to being an Ambassador for OneLegacy, the non-profit organization dedicated to saving and healing lives through organ, eye and tissue donation and transplantation. As an ambassador Elsa spreads the word about the life-saving power of organ donation and inspires others to register as donors. OneLegacy’s Ambassadors adopt cities, DMV field offices, high schools and hospitals. Through these community-based efforts, Ambassadors share their stories, encourage registration and engage leaders to make a commitment to the cause. The Donate Life Run/Walk & Family Festival is poised to achieve a new milestone this year on April 30, 2016 by setting a GUINNESS WORLD RECORDS™ title for the largest gathering of organ transplant recipients in one location. If the group of heart, lung, kidney, pancreas, intestine and liver transplant recipients assembled at the Donate Life Run/Walk is successful, the milestone will be the first of its kind on record. The mission of the Donate Life Run/Walk & Family Festival is to inspire and educate the community about organ, eye and tissue donation and encourage people to register as a donor. The Donate Life Run/Walk is produced by OneLegacy, the non-profit organization dedicated to saving lives through organ, eye and tissue donation in seven Southern California counties. All proceeds from the Donate Life Run/Walk benefit the OneLegacy Foundation, which conducts public education efforts to inspire people to choose donation and funds research to improve outcomes for donors, their families and recipients. Individuals and teams can register to participate in the Run/Walk at www.donateliferunwalk.org <http://www.donateliferunwalk.org/> , where information is also available for transplant recipients interested in joining the record attempt. 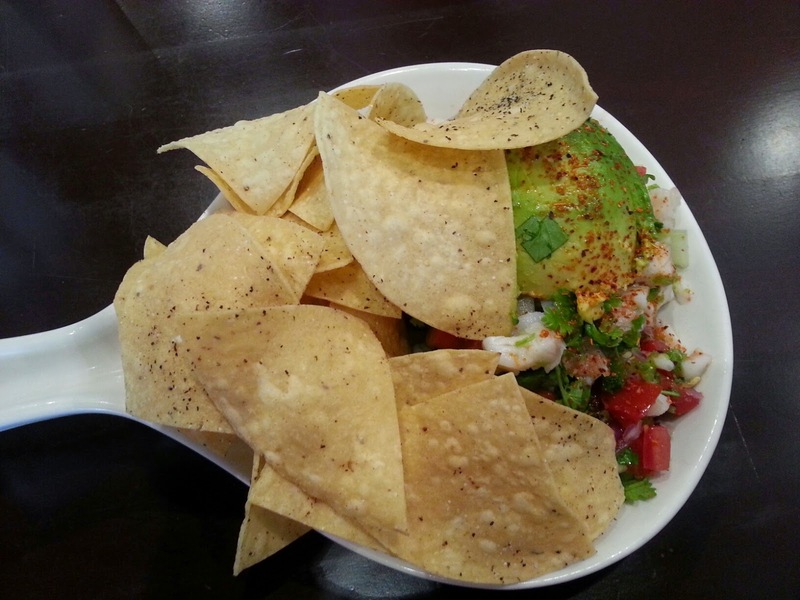 After food truck night, the corner of Balboa and Chatsworth is on its way to becoming Granada Hills’ new favorite dining destination, with two recently opened spots — breakfast and lunch joint Main Kitchen Café, and ceviche specialists Lola’s Baja Tacos. Both are delightful in their own ways, and both should serve as notice that the perpetually disappointing Pampas, right next door, better step up its game. Pampered Granada Hillsians typically whine if there’s more than 20 feet between their parking place and their destination’s door, yet ironically, it's the ample parking that may be Lola’s Baja Taco’s undoing. Set back from Chatsworth Street behind a small parking lot, the place is easy to miss, especially since buildings on either side come right up to the sidewalk, and since the same location has been home to at least a half dozen unnoticed failures over the course of its history. Yet Lola’s, one desperately hopes, will finally be different, because they do nearly everything right. The near blinding acid yellow of the paint on the wall is a hint of what’s to come. Order the watermelon mint or cucumber lime aguas frescas, but don’t finish your beverage before the entrees arrive — save some to accompany the meal. Lola’s food is aggressive with spice and tang, to great effect. It’s just the lively flavors one hopes for but so often doesn’t get, especially this far north of downtown. We had to order a second basket of chips to offset the acid of the ceviche and the heat of the salsa, but it was a good kind of hurt. Dessert was a fried glazed mango and ice cream dish, which I was afraid might be cloying, but was actually a delightful balance of hot and cold, rich and sweet. Some complain about the prices at Lola’s, which are way above the typical taco stand’s, but Lola’s isn’t the typical taco stand — it’s way above. 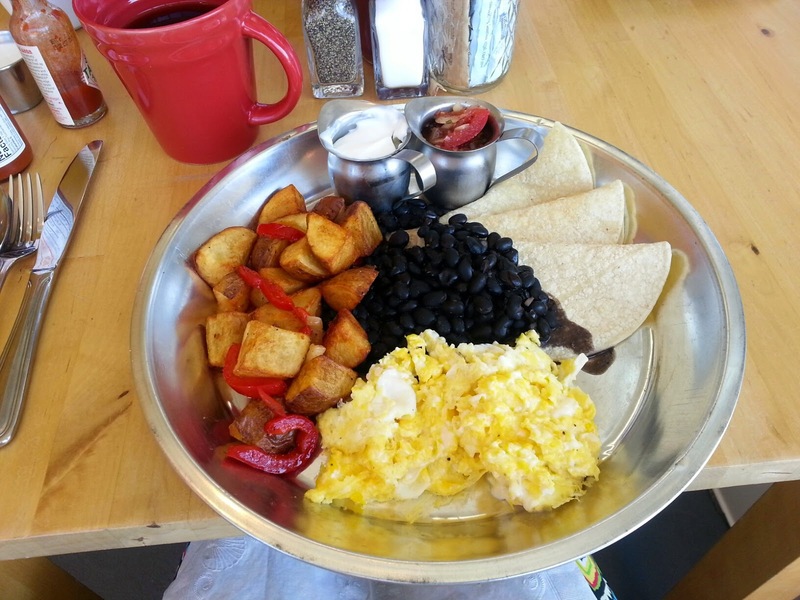 Tin plate breakfast at Main Kitchen Cafe. Not as aggressively cute as that other breakfast and lunch joint, Joe’s Cafe, Main Kitchen occupies a space that’s a wee bit more spacious and a lot more sunny. The décor is plain, yet fresh and clean, the best feature being a counter nestled right up against the kitchen, making diners feel like part of the action as you watch your food being lovingly yet efficiently prepared by the chatty chef/co-owner, who sings along to 80s and 90s tunes on the radio as he works. There’s the breakfast basics, plus a few nice additions like frittata, eggs Benedict, a breakfast burrito, and a lemon ricotta granola parfait. Lunch is similarly based in fundamentals — burgers, BBQ pulled pork and turkey Panini sandwiches, as well as a pesto chicken salad and a flawlessly executed fried chicken sandwich. How you feel about lunch here will in large part depend on how you feel about tater tots. They're served with everything. It’s a campy alternative to ubiquitous French fries that brings back warm, oily, salty memories of grade school cafeterias and college hangover breakfasts. But if you’re the sort of person that thinks s/he’s outgrown that sort of thing, stick to the salad. I could quibble (though it was still a good sandwich, the pesto chicken seemed essentially pesto-free, and I wanted a higher-rent cheese in the beet salad), but that seems like a waste of time given the scarcity of charming, independent, bricks-and-mortar dining options in this franchise-dominated town. I'd rather just spend my time sitting at that counter, sipping coffee, and watching the cook sing. The speech I gave at the last Granada Hills South Neighborhood Council meeting. I’m here to ask the Neighborhood Council for a letter of support for the plaza proposal. I’m not asking for money, I’m not asking you to become a community partner, because that’s not an option anyway. I’m just asking for a letter of support. Because the Neighborhood Council is the only organization that exists to act as a voice for the community. Every other community organization that Granada Hills has exists primarily to advance the interests of businesses. I don’t want to present this as community versus business, because that’s really the opposite of what this is. It’s not hard to see how foot traffic and appealing spaces invite people to linger in our central business district, how a feeling of pedestrian safety enhances a business district’s appeal. Last time I spoke at a General Meeting of the Neighborhood Council, it was quite rightly pointed out that I hadn’t yet done enough outreach to the business community. So I walked door to door on Chatsworth, between Zelzah and Yarmouth. And I got 14 signed letters of support from local business owners. And those 14 letters matter, but also, so do the opinions of the stakeholders who live and shop in this community, and whose needs those businesses exist to serve. Not the other way around. 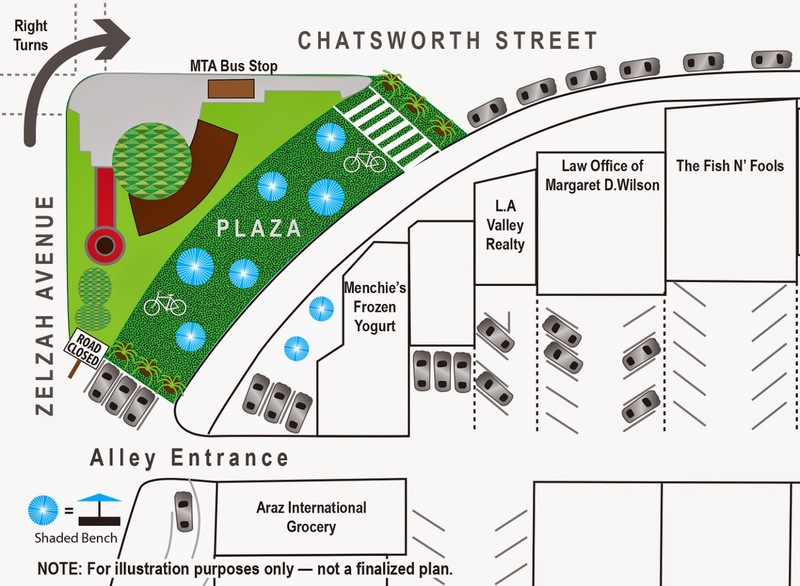 But the Rotary Club Foundation Board voted against the plaza proposal, and their reason for doing so was QUOTE: “We don't know of one business that is in favor of the project.” They also mistakenly believed that the plaza would block the alley. 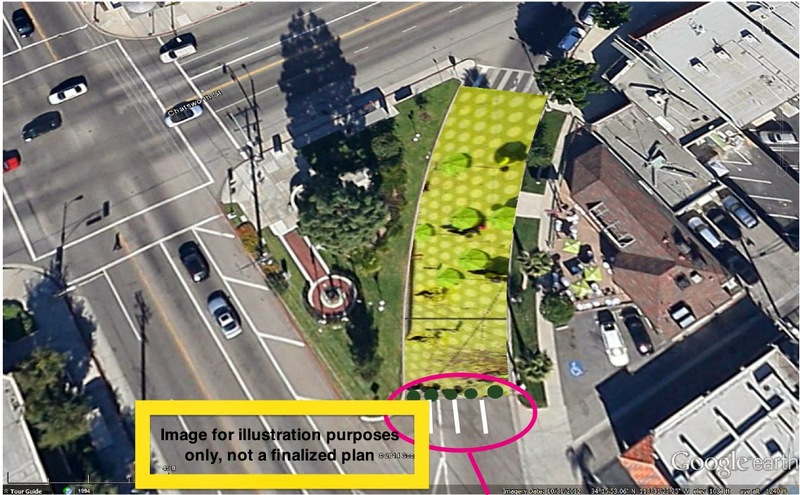 Then I learned that Granada Hills BID voted against the plaza, after their executive director answered zero phone calls and zero emails from me. Afterwards, when I spoke at their public comment, and mentioned the fact that we’re closing in on 1000 petition signatures, the BID President told me, QUOTE, “I couldn’t care less if there’s 30,000 names on a petition.” END QUOTE. Because their sole mission is to serve commercial property owners. Then the Chamber president said in a comment to a plaza supporter on Facebook, QUOTE “you have no skin in the game. The businesses there and the landowners are the only opinions that matter to the Chamber.” END QUOTE. Okay, fair enough — that’s the Chamber’s purview. But where can the public go to have their opinion matter? To have their skin in the game? Neighborhood Councils are the public’s only voice. My question for you is this: when do we start to matter? There’s this constant shifting of the bar. And we’re constantly hearing this message: you don’t matter. We’ve raised money on Kickstarter, and while it’s not a staggering sum, if you believe that every dollar is a vote, that matters. We’ve got high school kids walking through there every day, and they could use a safe place to be in after school. They matter. We’ve got tons of pedestrians walking through there every Friday night. They matter. BID’s sole mission is to represent business interests. Rotary represents business interests. The Chamber’s sole mission is to represent business interests. So this Council is really the only option the public has for a voice. Where the public gets to matter. It would be really great if there could be at least one organization in this town that says to the Kickstarter donors, the petition signers, the 14 business owners, to the public, to the community: you matter.